Brief Synopsis – An Interpol agent tries to learn the connection between a huge financial corporation and an arms dealing ring. My Take on it – This is a film that has a great idea but just doesn’t manage to find the proper way to present it so that stays interesting throughout. The way that they show the international espionage and conspiracy theory aspects of things is done in a very lackluster manner and it just doesn’t work well enough. Both Clive Owen and Naomi Watts are great actors but one wouldn’t know that by watching this film since neither are given roles that help highlight their talent. The storyline gets overly complicated and as things move along and they try to dive deeper and deeper into the plot things get quite convoluted and it’s much harder to follow what is actually going on. 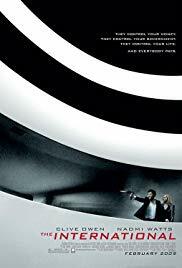 The best scene in the film is by far the one that takes place in the Guggenheim Museum. The unique layout of that building allows for a very interesting and gripping scene that allows the viewer to see the potential that this film has yet wastes it throughout most of the run time of the movie. Th scene is very thrilling and is by far the most memorable thing about this movie which is unfortunate because so much more could have been accomplished here if things had been done even slightly different. Bottom Line – Somewhat lackluster international espionage film. Owen and Watts are both given roles that don’t manage to highlight their talents very well. The storyline gets overly complicated and as the film moves deeper and deeper into the storyline things get very convoluted as to what is really going on. The scene in the Guggenheim is actually quite thrilling to watch, but that is unfortunately the most memorable part of this film.